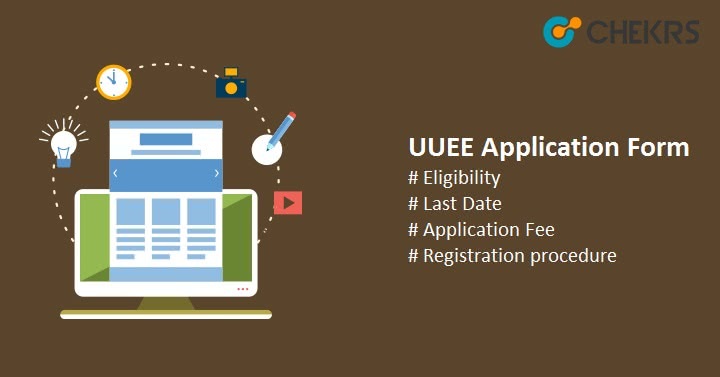 UUEE 2019 Application Form: Through UUEE you can get admission into various UG,PG & doctoral level courses in the Science, Professional Education, Medical, Commerce, Engineering, Law and Legal Studies, Management and Humanities field. The Uttaranchal University Entrance Exam Form will be available in Online and Offline modes. Candidates have to appear in the counseling to get admission. List of Coerces and their UUEE Eligibility Criteria is given below. We are also providing UUEE Registration and application submission Procedure. Dates and event list will be released with the official notification. Candidates have to check the official website regularly. We are providing Expected UUEE 2019 Dates here. Some basic UUEE Eligibility Criteria is given here, Candidates have to check their eligibility using the official notification. B.Tech (Lateral Entry) 3yrs Diploma/ B.Sc in PCM with minimum 60 marks. BCA Passed 10+2 with English and Mathematics with minimum 45% and 40% marks for SC/ST category. B.Com (Hons.) Must Be Passed 10+2 in any stream with minimum 50% Marks. LLB (Hons.) Having a graduation degree with 45% marks. 42% marks required for OBC and 40% for SC/ST category. B.Sc Passed 10+2 with Physics, Chemistry, and Math as main subjects with minimum 50% marks. B. Pharma Passed 10+2 with Physics, Chemistry, and Math as main subjects with minimum 50% marks. BBA Passed 10+2 with English with minimum 45% marks. 40% marks required for SC/ST. BA LLB (Hons. )/ BBA. LLB. (Hons.) Passed 10+2 with 45% marks. And 42% marks for OBC and 40% for SC/ST category students. M.Tech B.Tech/M.Sc./MCA in relevant discipline with minimum 55% marks. M.Sc B.Sc. degree with 50% marks and 45% marks required for SC/ST category with Chemistry as one subject. LLM Having 3 year/ 5year degree in Law with minimum 50% marks. However, only 45% marks required for SC/ST Category. UUEE Application Fee can be paid through both online and Offline mode. In Online mode there will be options like Credit Card/Debit Card/Internet Banking etc. Through offline mode, the payment can be done via DD. Candidate will have to make DD (Demand Draft) in favor of Uttaranchal University, payable at Dehradun. As we said The Uttaranchal University Admission Form will be available through both mode. We are providing the procedure for the same. Visit the Official Website i.e. uttaranchaluniversity.ac.in. Click on “Admission 2019 Apply Now” link. Enter all the asked details in “New Students? Signup” form. After filling all details Click on “Signup” button. Now Activate your account by following the link you will receive in the Email. After clicking on the link, You will be redirected to the Login/Registration Page. After login, Fill all the details in the UUEE 2019 Application Form. After it, Pay the Application Fee And take a print-out of Receipt and Application Form. Download the application form from the website by using the respective button. Fill all the asked detail like Academic, Personal, and Contact details and attach asked documents. That’s it, We hope this Article will help you to fill the application form. Make sure to fill all details correctly. After filling the Uttaranchal University Application form wait till the dates of counselling. Good Luck, Keep Visiting Keep Sharing.